See what others are saying about Weatherization Works. Our best advertising is our happy customers. We offer a large variety of services to keep your home as efficient and comfortable as possible. Renovation of the Two Editors Inn Into a Model of Efficiency & Renewable Energy. 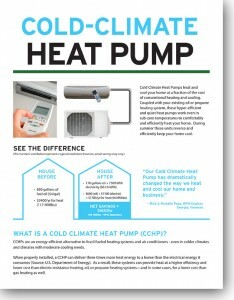 Cold Climate Heat Pumps heat and cool your home at a fraction of the cost of conventional heating and cooling. Coupled with your existing oil or propane heating system, these hyper-efficient and quiet heat pumps work even in sub-zero temperatures to comfortably and efficiently heat your home. See more information from Efficiency Vermont. Visit our sister company Solar Works For any of your Solar Energy Projects or needs.